In the previous section on bush fires, some of the causes as well as methods bush fires can spread were discussed. This section covers some of the methods necessary in estimating distances and relative heights of bush fires. These observations are important since they relate to the extent and severity of the bush fires. 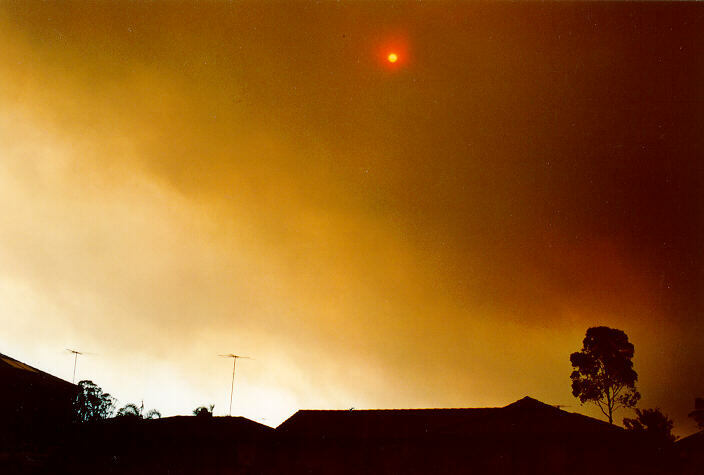 Most people can determine if there are bush fires around from rising smoke. But it can be quite difficult to locate the direction of the bush fire and especially the distance to the fire. A very intense and widespread fire will send up a smoke cloud high up into the atmosphere. 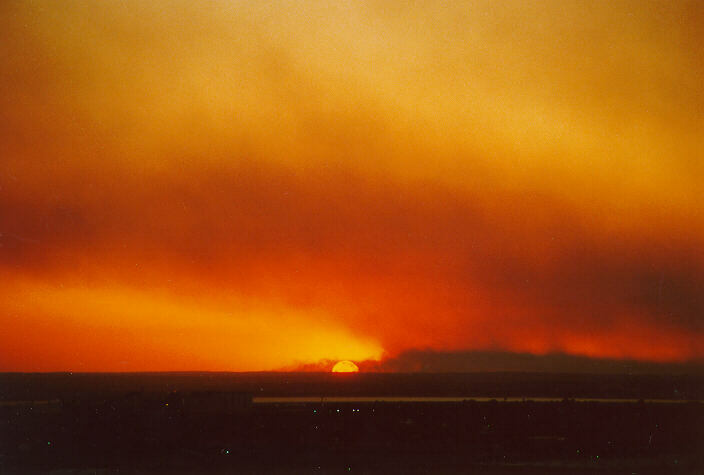 One of the most recent major bush fires occurred in 1994. This sent a large smoke cloud which covered the sun for a couple of days. This was an example of a very severe and widespread fire period. If fires are less widespread, they will obviously appear more isolated. Less severe fires are also more difficult to see in the distance since they don't send up thick smoke high up in the atmosphere. The distance to bush fires can be determined in several ways. First, the faster fires progress horizontally, the closer it is. If the fire seems to be approaching rapidly, it is very close and you may be in danger. If the fire seems to stay in the one spot for several hours, it is in the distance. Of course, the observer must allow for the strength of the wind which can vary the horizontal movement. 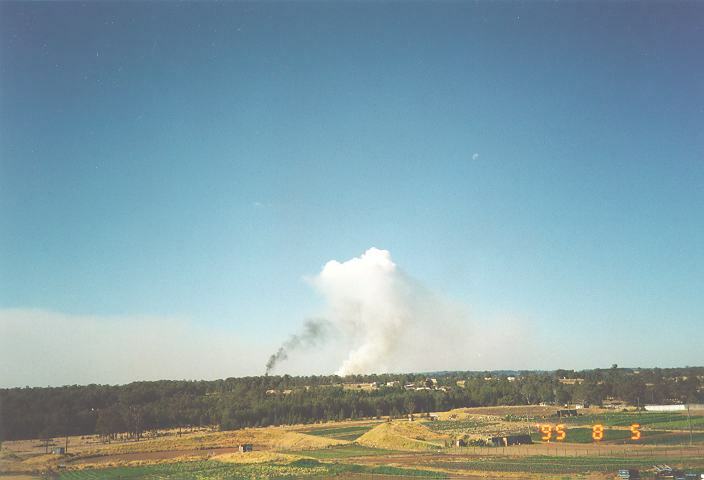 Second, distance to a fire can be determined based on the vertical movement of the smoke plume. The faster the smoke is seen rising, the closer the fire is to the observer. As the smoke rises, it normally spreads out at a certain level in the atmosphere due to an inversion. The rate that this spreads out in the direction of the wind can also give some indication of the distance to the fire. The height of this flattened layer above the fire compared to what can be seen of the foreground is also a good method of judging distances to fires. It may be assumed that the larger the fire looks comaperd to the ground, the closer it is. However, this is not good as a method as the observer must be careful in judging the severity of the fire first. A severe fire, as mentioned above, may go to extreme heights and hence may look closer. I have often heard of cases where people are tricked into thinking the fire may be in a certain area even though it may be further away. Another point to consider is that in mountainous regions, it may be even more difficult to judge. How can an observer tell if the fire is intense? 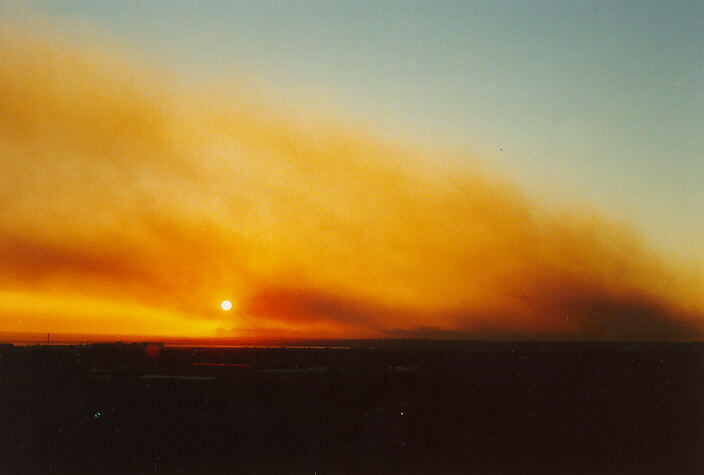 A very intense fire normally occurs during periods of dry and windy weather. The region must have been without sufficient rain for at least a month or two, or under dry windy conditions for a similar time. Severe fires result from strong winds. This causes them to spread quickly gaining on more 'fuel'; forest and undergrowth. The strong, dry winds supply fires with a much needed oxygen necessary for heat. 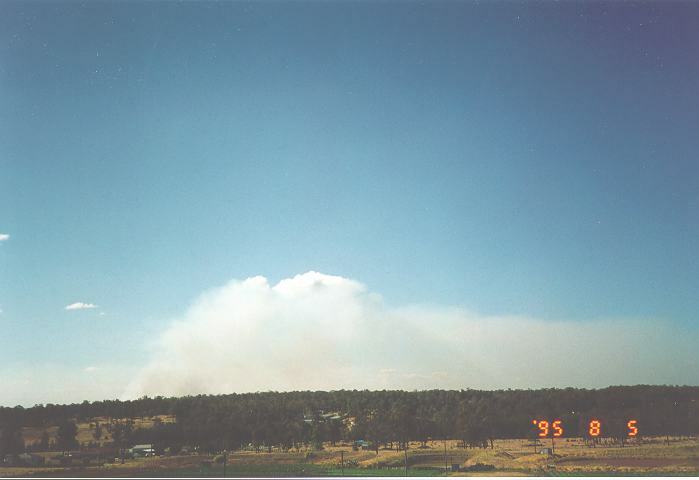 Becuase of this intense heat, smoke from severe fires rise rapidly and high into the atmosphere. Generally, the darker and denser the smoke, the more severe the fire. Again, this depends on the type of forest material. How can one tell if it is windy in the area of the fire? This depends on the intensity of the fire. The more intense the fire, the more vertical the plume should be. So if there is tilting, then there are reasonably strong winds in the area. But really, the weather conditions that cause fires are really associated with large scale synoptic situations. This means, winds do not vary dramatically within the surrounding areas. So it is reasonable to assume that the typical winds near the observed fires are similar to the winds experienced by the observer. Bush fires can lead to cloud formation. If the smoke from the fire rises to the condensation level, a change in the colour at that level will be observed and a cloud structure will form above it. In rare cases perhaps with unstable conditions, thunderstorms can develop over areas of intense fires. The most important point to make is that some or all of the methods mentioned should be used simultaneously to judge the severity and the progress of bush fires. I have separated them to illustrate different effects.